The Legends Of Kaanapali Luau at The Ka’anapali Beach Hotel tells the story of Ka’anapali and Polynesia through live Hawaiian music, beautiful hula performances, songs and storytelling. My family had a fantastic time. We really enjoyed the great service, wonderful cultural environment, and it’s located at the most authentically Hawaiian resort in Kaanapali! 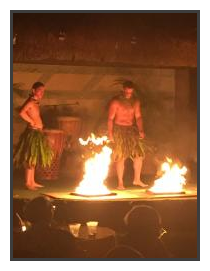 From my experience (we come to Maui every year) this luau stands out from all the rest! What an exciting and memorable show. Every single host/hostess were the nicest and friendliest people you could ask for. They made sure all our needs were met, and did I mention they all had a sense of humor? 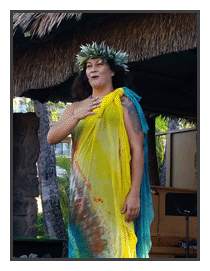 The show host explained all the dances and their meanings, which was fascinating, and added a lot to the luau. Oh my gosh – the luau! That could fill a page all by itself! When you first arrive, you’re greeted by local artisans and craftspeople, which is a lot of fun just browsing around and learning about local Hawaiian crafts. I bought a beautiful lei and some earrings for my daughter. Then they blow the conch shell and you’re invited into the show and dining area. The food is amazing! So many choices – they have fire-roasted Kalua pig, authentic poi (which is a challenge to eat with your fingers that I didn’t master! ), Kalbi beef, chicken, MahiMahi in a delicious sauce, salads, fruits, steamed vegetables, and a great selection of deserts (although you’ll probably be bursting at the seams by the time you get to dessert). Then the show starts. The performers were all excellent and the fire dancers were the best we have ever seen! Well worth the money for an unforgettable night of great food, drinks and entertainment. If you can only make it to one luau while on Hawaii – THIS IS THE ONE! You can make reservations on line at LegendsOfKaanapali.com or call 1-800-262-8450.